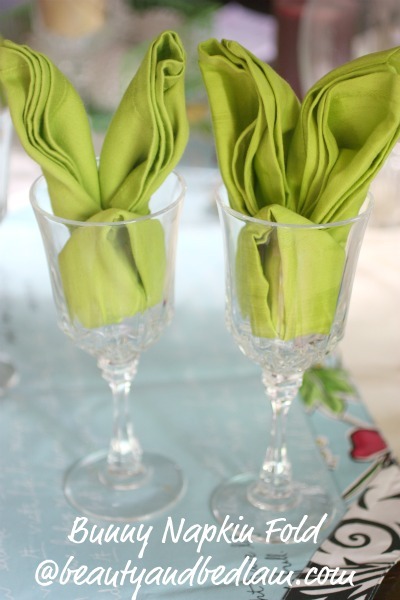 When I entertain, I love to create and develop a simple, yet fun and elegant tablescapes on a budget. I always make sure that some unique napkin fold comes into play. 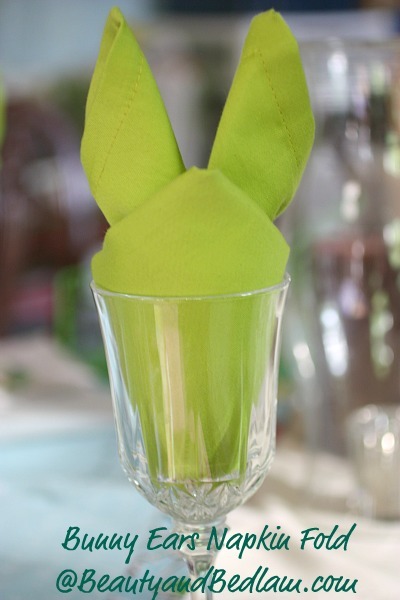 Learning to fold napkins is such an easy way to dress up a table, and pulling an Easter table together with these cute Bunny Napkin Folds will add just the perfect touch to your table decor. I played around with the directions below until I got just the look I wanted. If you compare the first picture, with the second, you will see a slight difference as I experimented on these Easter napkin folds. Remember that purchasing napkins doesn’t have to be expensive. It can be as simple as cutting left over fabric into squares, searching your local thrift store or hitting up the dollar store. I am always on the look out for high quality linens either on clearance or at yard sales, since I love to mix and match various colors throughout the year. 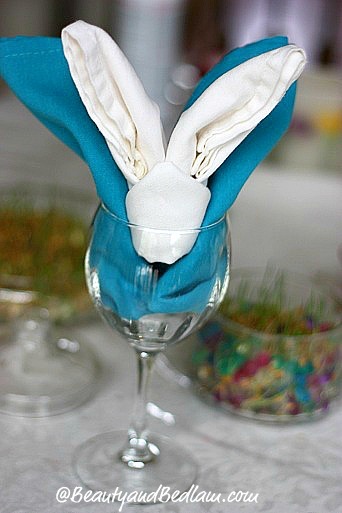 When deciding on napkins, thinner and larger napkins work best for this Bunny Napkin fold, but use what you have. I have done this fold with all sorts of napkins. Preferably, pick a solid colored square napkin. Obviously, starched is best, but if I waited until I starched that many napkins, I would never fold them, so I am showing you how a nicely wrinkled napkin works. 🙂 Thinner, and larger napkins work best, but again experiment with with what you have. Once you get the hang of folding one or two, the rest will go very quickly. 1. Fold the napkin in half. 2. 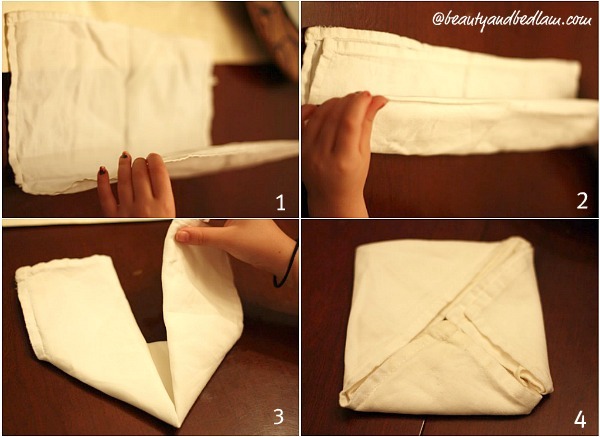 Fold the napkin in half again, to form a long rectangle. 3. Grab the corners. Fold both the right and left side up to meet at the center, forming a point. 4. Repeat with the opposite corners, so it now forms a square. 5, 6 Fold two of the corners in so that they meet in the center, but don’t fold them exactly straight. If you look closely, once you pull up the sides above the center point, you’ll see the ears starting to shape. The napkin will form a kite shape. 7. Gently flip the napkin over. 8. 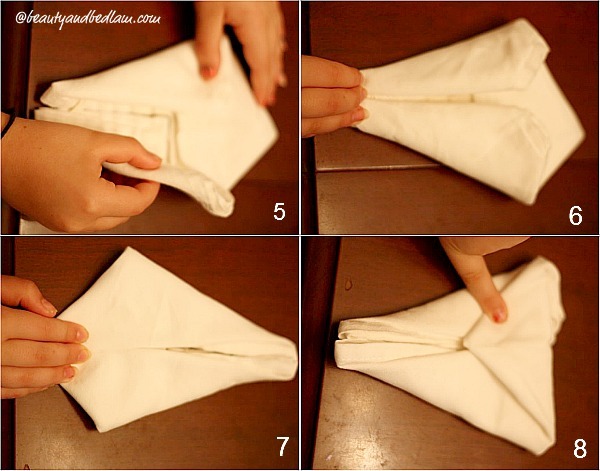 Fold the bottom point up, so that it’s about an inch above the center of the napkin. The napkin I am using for the picture is so small that I had to proportionately adjust that one inch. 10. Roll the right side over, slightly past the center of the napkin. 12. Turn the napkin upright, separating the bottom to form a base if you choose to use it on a plate. Fluff the bunny ears. 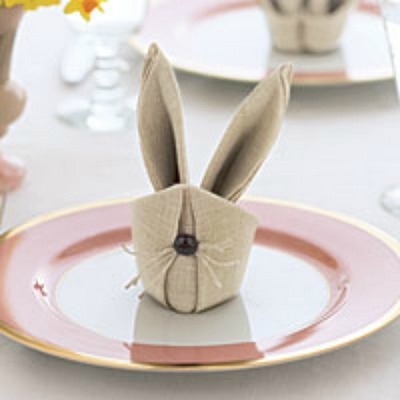 For those desiring to go all out, Good Housekeeping shows how to dress up the napkin to look like the bunny face. Cut three pieces of string; knot them together in the middle. Slide a safety pin through the back of the folded napkin, through the center of the knot, through the button’s opening, then back into the napkin; clasp. Since I do not live in a Pinterest Perfect World, and I will never have the time to go all out sewing those cute bunny faces on my napkins, I just work with what I have and I love it. You can see now how small the white napkin was in relationship to an ideal sized napkin, but again, be creative and make it work for you. If I can make these work at 11 pm, I have faith that you can as well. Have fun and enjoy the process. 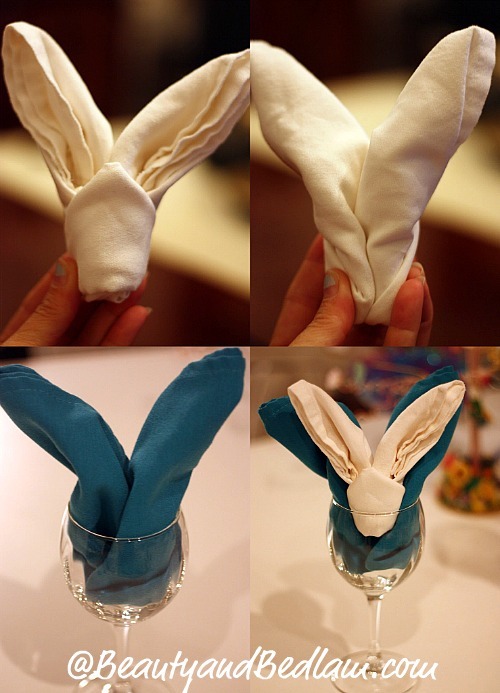 If you have children, get them involved with the creation of these Bunny Napkins. They will have fun and feel so special that they could make this tablescape come alive. 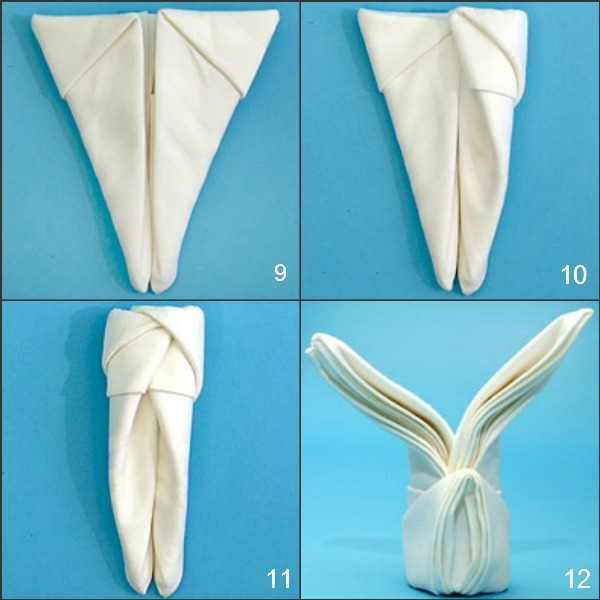 If you’d like to try an easy napkin fold, this one is a favorite of ours. Vary the Christmas theme, by tucking in pieces of grass, twigs, small eggs or flowers for a spring touch. THANK YOU! I so wanted to do this. Its driven me crazy BUT your directions are a lifesaver!! Happy Easter to you and yours! !